1.Even one person can take good pictures and record the perfect video. 2.It's 3 colors lighting mode and 10 adjustable brightness make you look more beautiful! 【Q】Is it come with the adapter for wall? 【A】No,It can be connected to computer host,laptop,mobile power and USB charger when you using. 【Q】Does it have a battery? 【A】No，it doesn't,it has a USB connector so that you can connect the power to use selfie ring light with cell phone holder.Very easy to use. 【Q】Does it work for the iPhone 8 Plus? 【A】Yes,of course,it's fit your iPhone 8 Plus.The size of the mobile phone that can be clamped is between 2.32inch - 3.34inch,it is suitable for most mobile phones on the market. 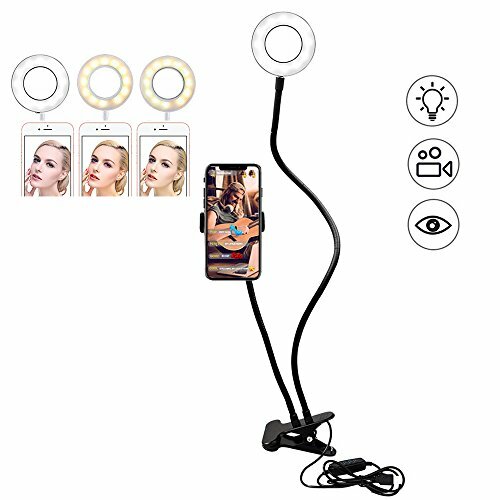 【ONLINE CELEBRITY HUGELY POPULAR】★2 in 1 selfie ring light with cell phone holder can be folded up to take anywhere,360 degree rotating can free to adjust to any angle,it can for live broadcast,live show,selfie,taking pictures,Video chat,reading books and so on. 【PERFECT LED LIGHT DESIGN】★3 colors lighting mode and 10 adjustable brightness for your choose,meet all your needs in different circumstances.3 colors lighting mode: white,warm yellow,warm yellow + white. 【USB POWERED LED LIGHT】★The USB ports can be used with multiple devices,such as connect computer host,laptop,mobile power and USB charger.You will be able to enjoy both the mobile phone holder and the lamp at any time freely! 【WIDE COMPATIBILITY】★The support width of this cell phone holder minimum is 2.32inch(5.9cm) and the maximum is 3.34inch(8.5cm),and it will be compatibility most of smart phones,such as iPhone 8,7,6s,6s plus,HTC, LG,Samsung series,Huawei etc.The sturdy clip base can be clipped on tables and bed etc,it can prevent the slipping of the mobile phone. 【WARRANTY】★Every Gemwon product includes 18-month warranty.Please buy with confidence and don't hesitate to contact us if having any question,we'll get to you within 24 hours. If you have any questions about this product by Gemwon, contact us by completing and submitting the form below. If you are looking for a specif part number, please include it with your message.